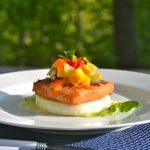 Grilled Vidalia Onion slices are stacked with Teriyaki Salmon and Sweet & Spicy Salsa for a refreshing and light summer meal . Combine onion marinade in small bowl. Layer onion slices in a baking dish pour marinade over slices. Cover with plastic wrap and refrigerate 1 hour. Combine ingredients for Teriyaki marinade. Place salmon in baking dish, pour marinade over salmon pieces. Cover with plastic wrap and refrigerate 1 hour. Combine salsa ingredients in medium sized bowl, cover with plastic wrap and refrigerate until serving time. Heat grill to medium coals or medium high for gas grill. Grill onions 3 minutes on each side. Place salmon on top of grilled onions and cover grill, cook 3- 5 minutes until salmon is flaky. Serve grilled onion and salmon with sweet and savory salsa. Make Ahead marinade up to 24 hours. In a hurry, marinade at least one hour. Salsa can be made ahead up to 2 hours prior to dinner.